How to Build a Farmhouse Table - Full Video & Plans! Farm tables have a rich history all around the world. Their simple utilitarian design gives them their charm. 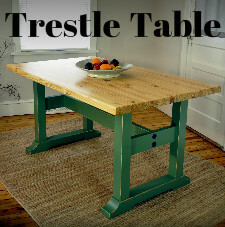 Farm tables work well with just about any style home -- country, modern or eclectic, for example. Whether a farm table is an antique or a reproduction, the history associated with them makes each one stand alone as an artifact. 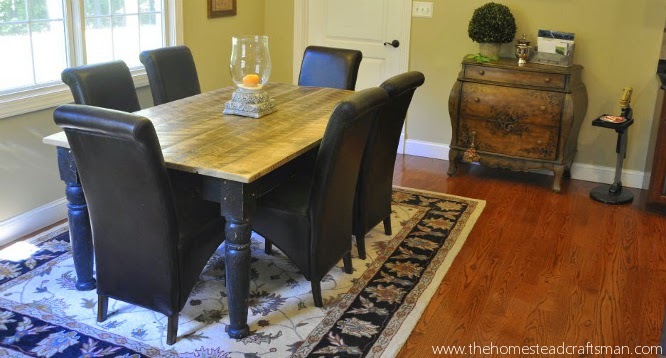 This is the reason farm tables do not have to match the decor that surrounds them like other style furniture. They are like sculptures in this way, yet, in application they are simply worktables for the kitchen as well as a place for families to gather around for meals. These aspects of farm tables are in part what initially attracted me to them, and ultimately influenced my decision to focus on making them for customers. I have made quite a few of these tables and am pleased to know the role they play in my customer's lives. In the same vein I decided I wanted a way to make the same impact on a larger scale. By making this set of plans I, with the help of fellow craftsmen, will be able expand the number of homes and families my table design can reach, more so than I could ever achieve on my own. This table is simple. It has four legs, four aprons and is constructed with pegged mortise and tenon joints. The top is a simple glued up slab of reclaimed lumber, in my case, but you can choose anything you would prefer. The top is the most obvious and impactful element that makes your table stand apart as unique. The legs are in the same boat. I demonstrate and give dimensions for a turned leg made on a lathe; however, you can turn a different design, or go with a more primitive leg shape like a taper for example. Regardless of your end design, simple, easy to obtain materials can, and should, be used, as that’s kind of the spirit of this style table. The materials are not flashy; it’s just a table to be a table with subtle design elements that make them so desirable. This handcrafted set of woodworking plans makes it possible to have this vary table in your home!